Brooks Instrument mass flow devices have industry leading mean time between failure (MTBF) which provides the user with maximum up time. MTBF for several SLA Series mass flow controller models is shown below. This MTBF information is based on actual shipments and warranty returns over a 1.5 year period. 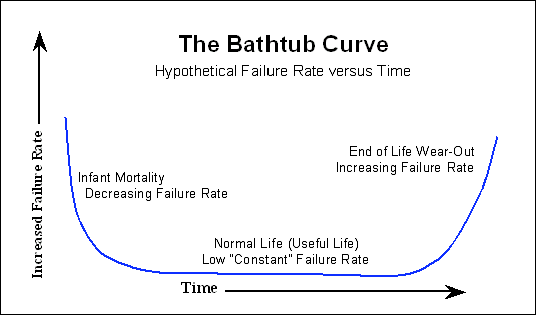 This period includes the infant mortality phase shown in the "bathtub curve" below and as a result likely underestimates the MTBF. 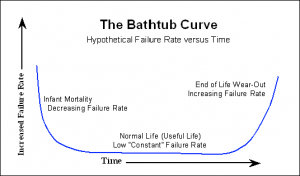 [caption id="attachment_1485" align="aligncenter" width="300"] The Bathtub Curve illustrates hypothetical failure rate versus time[/caption] If you have questions about MTBF or any Brooks Instrument products or services please contact one of our applications engineers or your local Brooks Instrument sales expert. W. Torell & V. Avelar; "Mean Time Between Failure: Explanation and Standards"; APC White paper #78.